Keysight Technologies, Inc. (NYSE: KEYS) today announced the addition of several powerful new capabilities for the ultrafast-scanning 9500 atomic force microscope. These new capabilities include quantitative mapping of nanomechanical properties as well as electrochemistry applications and scanning electrochemical microscopy (SECM) techniques. The Keysight 9500, already being embraced by scientific and industrial markets due to its remarkable ease of use, unrivaled scan rates up to 2sec/frame and comprehensive environmental control. These new 9500 capabilities are enabled by Keysight NanoNavigator, a software package whose workflow-based graphical user interface (GUI) makes the system easy to operate for AFM users of all skill levels. The latest version of NanoNavigator enables Quick Sense, a new Keysight imaging mode that permits quantitative mapping of nanomechanical properties on a wide range of samples. Quick Sense lets users quickly and easily set modulation amplitudes and frequencies, acquire individual force-distance curves and measure adhesion and stiffness. All of the data is collected while the 9500 AFM simultaneously images the sample’s topography, resulting in precise and accurate characterization of local mechanical property variations at the nanoscale. Furthermore, for electrochemistry applications, the new version of NanoNavigator provides control of potentials and cyclic voltammetry, affording researchers a useful complement to the 9500 system’s comprehensive in situ imaging capabilities. In addition to electrochemistry applications, these environmental (gas, liquid, air) and temperature control capabilities facilitate advanced applications associated with materials science, life science, polymer science and electrical characterization. 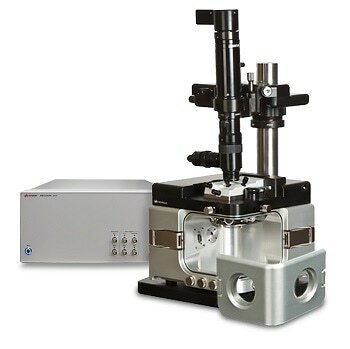 The latest version of NanoNavigator also supports AFM-SECM, a powerful Keysight scanning probe technique suitable for investigating surface reactivity and studying processes at the solid/liquid, as well as the liquid/liquid interface. Redox reactions and their kinetics involving active species are of fundamental importance in emerging research areas ranging from the analysis of biochemical signaling processes (e.g., in live cells and tissues) to addressing materials science questions associated with such fields as fuel cell technology, catalysis, sensing, and environmental chemistry.